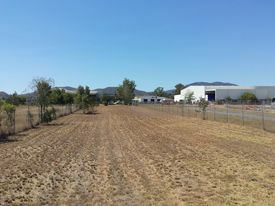 59 Commercial Real Estate and Properties in Rockhampton are listed in 7 categories. We have 61 Industrial Warehouses for Sale , 58 Development Lands for Sale , 45 Offices for Sale , 35 Retail Shops for Sale , 20 Other Commercial Properties for Sale and 9 Hotels and Leisure for Sale . This property is a great industrial site with plenty of room for additional improvements. 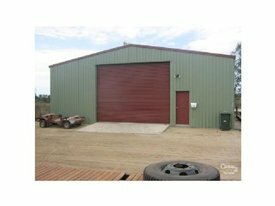 Set to one side of the block is this high roof 2 bay roller door shed with block office, mezzanine for storage and amenities. Set on 4133m2 fully security fenced land area with hardstand and open yard area this property is certainly worth taking the time to view. Ideal for workshop for a multitude of businesses. 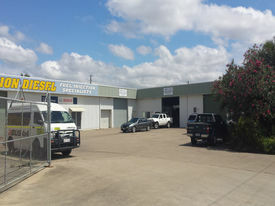 277m2 Workshop with 35m2 Mezzanine 56m2 block air conditioned office Roof height of shed 5 metres to 6 metres at apex 2 x 4m high with 3.5m width roller doors Contact Ray White Commercial Gladstone for inspection. An excellent opportunity to secure a substantial industrial site comprising of a total floor area of approx 3000m2 on a 8054m2 allotment Its general layout is made up of a large industrial building with two levels of offices of approx 400m2 and warehouses at the rear with loading bays. There are two tenants currently in the building until June 2019. Present holding income of approx $161,000 in total and the office complex is vacant. 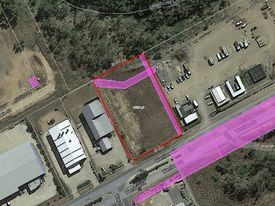 This large prominent site is centrally located close to major road networks and offers good access to the Northside and Southside of Rockhampton. Building Area 897m2 (approx. 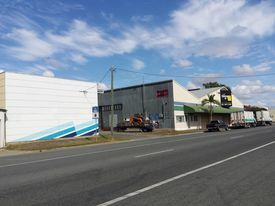 23m x 39m) comprising 2 storey area inside building with office lunch room of 180m2 Drive through building with 2 street frontages Concrete apron areas at both ends of building Large access roller doors 1x 7.3m wide, 2x 4.4m wide Close easy highway access Contact Chris Tomkins 0418792208 Today. 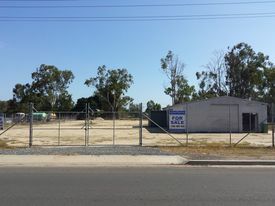 For Sale  Freestanding Inner City Industrial Shed Hardstand Offers to Purchase Consid.. 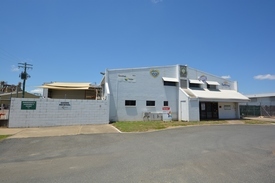 Perfectly positioned in the light industry hub of Rockhampton's CBD, this freestanding brick and metal clad building is now available for sale. 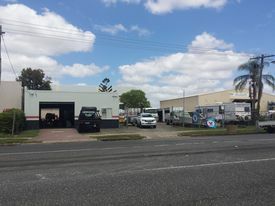 The location and improvements of the property are ideally positioned to provide for multiple industrial users that service Central Queensland and beyond, just 4.3km from the Rockhampton Roundabout southern highway entrance . 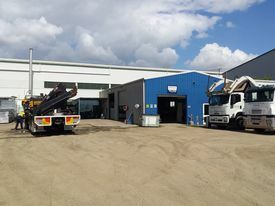 The site is improved by a mixture of concrete and gravel hardstand, double storey brick offices with staff amenities, open plan fully lined insulated shed and vehicle wash bay. Key features of this property include: Total land area 2,684m2² on 5 titles Metal clad 450m² insulated warehouse Double storey brick 360m² air conditioned offices including undercover garages Secure site with full perimeter fencing on site car parking Concrete and Gravel yard at side allows for large truck turn around Vehicle wash bay 4 High bay roller door access Near new internal Cold Room To arrange an inspection, please contact Jade Carr from Ray White Rockhampton City today. This property is being sold by Offers to Purchase therefore, a price guide cannot be provided. The website may have filtered the property into a price bracket for website functionality purposes only. Two Separate Titles On Prime Highway Frontage Offers to Purchase Closin..
Country Pub with 10 Boarding rooms upstairs or redevelopment site, the price will surprise, owner needs it sold!! 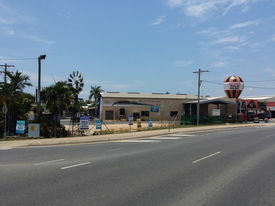 An opportunity now exists to purchase this hotel in this high traffic exposed, North Rockhampton location. Positioned on a very generous 1,608 m2 corner allotment on two titles, the site boasts a two storey Hotel and fully concreted, expansive carpark with dual street access driveways. The Hotel has a main bar, a bistro / function room area and 10 boarding rooms upstairs. There is also potential for re opening a drive through bottle shop~^ with a second cold room. The Hotel is not currently operating and would require significant renovation to re open. The Liquor Licence is currently maintained by the Seller and will be signed over^ to the Purchaser upon settlement. The site also has enormous potential if demolished for a redevelopment site~ in the future. bull; 1,608 m2 corner allotment on two titles bull; Two storey Hotel bull; Large concreted carpark, dual access bull; Main bar and cold room with beer taps bull; Bistro / Function room with second bar bull; 10 Boarding rooms, lounge, toilet and bathroom facilities upstairs bull; Second cold room in old drive through area bull; Redevelopment Potential~ approx. ~STCA Subject to Council Approval ^Subject to liquor licencing laws photos for display purposes, taken mid 2016. The vendor has given us clear instructions, they want this property sold as it is now surplus to their needs. Right in the heart of the Parkhurst Industrial precinct close to high profile manufacturers and suppliers such as Thiess, Queensland Magnesium and SMW Group to name but a few. This is a level, corner block with excellent frontage, zoned Medium Impact Industry. 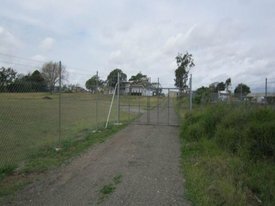 Land Area 8094m2 Medium Impact Industry Corner allotment Three road frontages (Two formed) Further subdivision potential approx. Small Shop For Sale. $130,000 + GST if applici.. 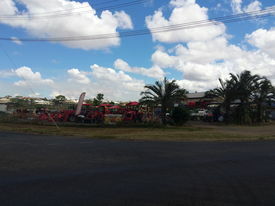 Located on busy Gladstone Road is this shop of 50m2. The shop is located in a small mall and is perfect for someone who has a business and no longer wants to pay rent. Call today for an inspection.